Early in the season, when Hendricksons are in the water, a size 16 WD-40 has done well for me at multiple rivers. This fly did very well for me during a recent outing. I usually make the thorax with squirrel for a spiky look and add a touch of Krystal Flash on top of the wingpad, too. Krystal Flash has greatly increased take rates for me. I think the material suggests an air bubble. I’ve used different colors, but pearl has been best. Now, though, I am making the thoraxes from CDC fibers. 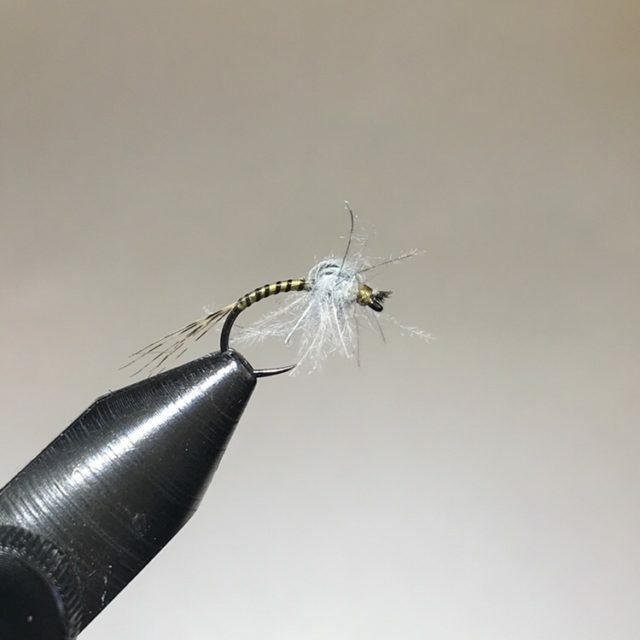 I’ve been using the tips to make some new size 30 midge flies and have a bunch of leftover feathers. So, a variant. Body: UTC, 70 denier, olive. I use a black Sharpie to color the thread and rib the fly. Nice tie. Ever try polish quills for the body? They make really nice segments. How do you present this fly? I do strip peacock herl at times and use that as the body for flies. I fish this up top or below the surface (both dead drift and on the swing), depending on where I think the fish are focused. I second Steve’s comment on polish quills. Much easier than stripping herls and they come in different colors. With UV resin it makes a killer segmented body. I like the CDC on this – did you catch with it the other day? Not on Saturday. Yes, many takes on another outing: sunny, no wind, many BWOs popping. This fish, for example.